Shani Mootoo is known for her work as an artist and writer. She was born in Ireland in 1957, grew up in Trinidad, and has lived in Canada since the early 1980s. Mootoo studied fine arts at the University of Western Ontario where she began to paint and produce video works. She earned a master of fine arts equivalent at the Emily Carr College of Art and Design in Vancouver in 1982. Mootoo's collection of short stories Out on Main Street was published in 1993. This was followed in 1996 by her first novel, Cereus Blooms at Night, which was published in fourteen countries and was a finalist for the Giller Prize, the Ethel Wilson Fiction Prize, and the Chapters/Books in Canada First Novel Award. In 2001, Mootoo published a collection of poetry, The Predicament of Or. Her second novel, He Drown She in the Sea, was published in May 2005. Mootoo has been a writer in residence at the University of Alberta, at Mills College in Oakland, California, and at the Varuna Writers Residency program in Australia. She has taught writing at the University of Alberta, Capilano College in North Vancouver, the BC Festival of the Arts, and the BC Arts Council. Her visual art and video productions have been exhibited at the Museum of Modern Art in New York, the Queens Museum, the Vancouver Art Gallery, and the Venice Biennale. The fonds reflects Mootoo's work as a writer and artist. It contains printed typescripts of published works with drafts and related working papers, published reviews, drafts of unpublished works, lecture notes, professional correspondence, notebooks and sketchbooks, video productions in VHS format, audio materials and works of visual art. The fonds has been arranged into 8 series: Literary works; Correspondence; Interviews; Book reviews and announcements; Notebooks and early writings; Artistic works; Photographs; and Ephemera. Some of the series are further subdivided into sub-series. 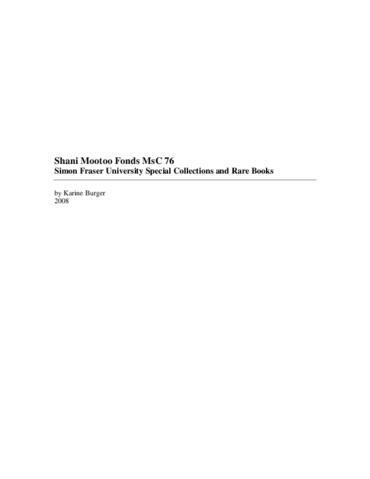 The Shani Mootoo fonds was acquired from Shani Mootoo by Simon Fraser University in 2005. The records were received in indeterminate order. Original order has been reconstructed where possible by the archivist. Includes 5 VHS format videocassettes, 4 audio cassettes, ca. 40 photographs, 17 slides, 1 triptych, 2 gallery exhibition photocopy prints, and 2 paintings in wood frames.